This content is made possible by our sponsor and does not necessarily reflect the views of NBC. 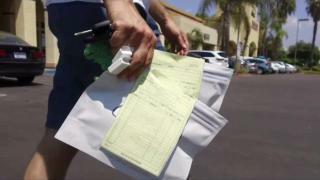 A crackdown launched in August 2017 on illegal marijuana delivery services is making a small dent in the underground pot delivery market operating within San Diego. Some marijuana proponents say the only way to get rid of the black market on delivery services is to open a path for them to operate within city limits legally. “The black market is absolutely flourishing. It’s just getting bigger and bigger,” said Elizabeth Wilhelm, former owner of Timely Holistic Care, which delivers marijuana in San Diego. No “delivery only” services are licensed or legally allowed to operate within San Diego. The San Diego Police Department has shut down 11 illegal marijuana delivery services, according to a report being made Wednesday to the Public Safety & Livable Neighborhoods Committee. SDPD Lt. Matt Novak said investigating delivery services is a much bigger strain on police resources than enforcing regulations on storefront dispensaries. “Delivery services will pose a much more lengthy investigative process due to their mobility and multiple storage locations,” Novak told the City Council’s Public Safety and Livable Neighborhoods subcommittee last December. Novak, who leads SDPD’s Narcotics unit, also told NBC 7 the underground business can be a magnet for crime. In San Diego, only licensed marijuana dispensaries can operate delivery services. Those dispensaries are only allowed to operate in approved zones in the city. During a quick review of online advertisers, NBC 7 identified dozens of unlicensed delivery services advertising business outside of those zones on Tuesday. The advertisements often operate much like Uber, showing users exactly where a person delivering marijuana is nearby in a vehicle, making it easy for those drivers to become targets for crime, according to police. NBC 7 Investigates developed a computer program to monitor marijuana ads posted online and found more than 400 postings since September 2017. Since August 2017, the SDPD has issued 15 search warrants, made 34 arrests, confiscated 230 pounds of marijuana and $60,000 in cash during their targeted enforcements of illegal delivery services, according to a document available on the city’s website. Wilhelm said the police action is only driving markets further underground and is expanding the black market for pot. The committee is scheduled to hear an update from the San Diego Police Department on Wednesday. © NBCUniversal, Inc. All rights reserved. NBC on DemandWatch the latest full episodes of your favorite NBC series anytime and anywhere.